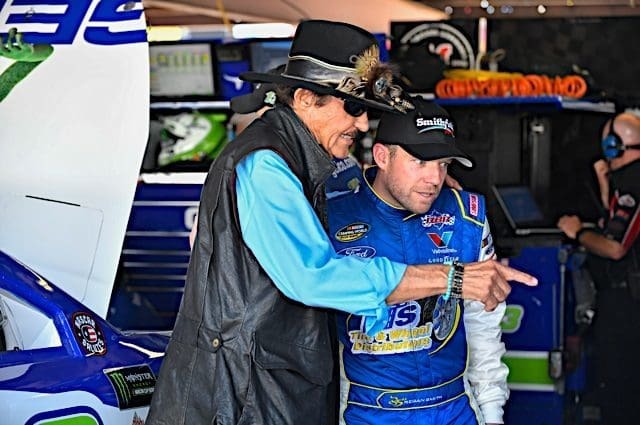 4 Burning Questions: Wait, Does Richard Petty Really Have 200 Wins? Home / 4 Burning Questions / 4 Burning Questions: Wait, Does Richard Petty Really Have 200 Wins? Should some of Richard Petty’s wins be taken away? 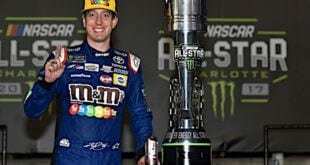 Ever since Kyle Busch won NASCAR race number 200, there’s been a slew of talk online comparing this accomplishment to Richard Petty’s 200 Cup Series wins. This column is not going to get into that this week, because it already covered this topic a few weeks ago. Rather, one interesting side note to this story has been a discussion as to whether Richard Petty’s 200 wins should even count. All of this began when Jeff Gluck’s website ran a guest column where Jason Higgins introduced a new metric: Era-Adjusted Wins. Outside of some examples and outright saying that qualifying races shouldn’t count, Higgins did not do a full breakdown of what’s counted and what isn’t, but it did put Petty’s win record at 116, 23 more than Jeff Gordon in second. Dale Earnhardt Jr., a man so even-tempered that he calls people he’s mad at “uncouth,” got unusually defensive about Petty’s record on Twitter and on his podcast. Why does it hurt my heart that the Kings wins are now being debated? It’s not weird. But different. It was a different time. Things change. I lived over 30 years believing the King won 200. Celebrating it along with the rest of the NASCAR world. Hard to wrap my mind around it being a stretch of the truth. So, should Petty’s 200 Cup wins count? Ultimately, yes. In the latter half of last year, I came up with an idea similar to Higgins’ but ended up abandoning the project for three reasons. The first is that doing something like this is incredibly unfair to drivers from the 1950’s. Back then, the “big” races were mostly limited to just the old Daytona Beach course and the Southern 500. 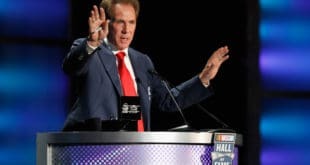 Hall of Fame drivers such as Herb Thomas, Curtis Turner, and Lee Petty would have massive bites taken out of their win totals. The second is that it was hard to decide what should or shouldn’t count. At first, my idea was to only count 200 mile races. Well, if that happens, then a ton of road course races from every era wouldn’t be counted, including all of the Daytona Beach races. But if all road courses are counted, should a 72-mile race between 14 cars in 1958 at a makeshift road course in an airfield count? So at that point, you’d need to cherry-pick results, something a metric shouldn’t really do. The third and final reason is that, ultimately, it doesn’t matter. There’s no way to conclusively say who’s the best NASCAR driver of all time, because at the end of the day, the drivers who raced before 1972 (or the Modern Era) generally only cared about winning races, largely ignoring the points championship. That’s something that has absolutely no correlation between eras in other sports; no other sport has a period where a large number of competitors did not care about winning a championship. 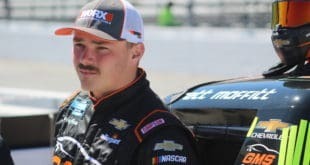 So, what could NASCAR do to at least compare recent drivers better? It’s simple- use the Modern Era parameter more. Instead of overall victories, look at Modern Era victories. Instead of saying Petty has the most top fives of any other driver, say Gordon has the most Modern Era top fives of any driver. It’s factual while also not being indicative of bias against the previous era, nor is it as confusing as taking wins away from drivers simply due to the era they drove in. You see this in the NFL often, with various records being broken over the course of a season noted as being in the “post-merger era”. This is because, before the NFL merged with the upstart AFL in the 1960’s, it was a 12 team league, usually with just a single playoff game and a haphazard, inconsistent schedule. NASCAR has a set point in its history where the sport evolved from its humble beginnings into something at least somewhat similar to its current product on the field… er, track. It’s really dumb that both the sanctioning body decides not to use it nor many historians of the sport. What’s the deal with Hendrick Motorsports? This season has been a fairly interesting one to watch Hendrick Motorsports and how they’ve been able to perform against their own engine customer cars. The highest Hendrick driver in points is Chase Elliott in 12th. That’s okay, but consider that the Hendrick powered duo of Kyle Larson and Kurt Busch are eighth and ninth in points respectively. Busch in particular has had a great start to the season, running in the top 10 for seemingly the entire year so far. Meanwhile, Larson has had a quiet start with just two top 10s, but he’s also won a stage and hasn’t finished outside of the top 12 yet. Compare that to the Hendrick foursome of Elliott, Jimmie Johnson, Alex Bowman, and William Byron. 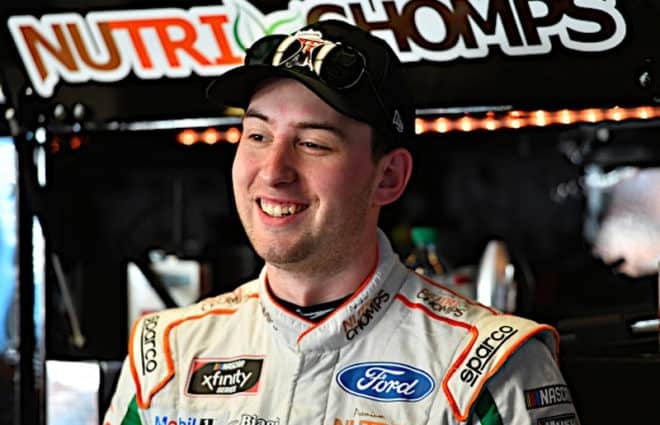 All four are between 12th and 19th in points, and if we discount Byron’s strong run at Daytona, they’ve only led four laps in five races and have less top 10s combined than Busch (three versus four). Even the JTG-Daugherty Chevrolets, while not having the results yet, have shown good speed. Not on par with even Hendrick, but certainly enough to where you can blame the engine department. 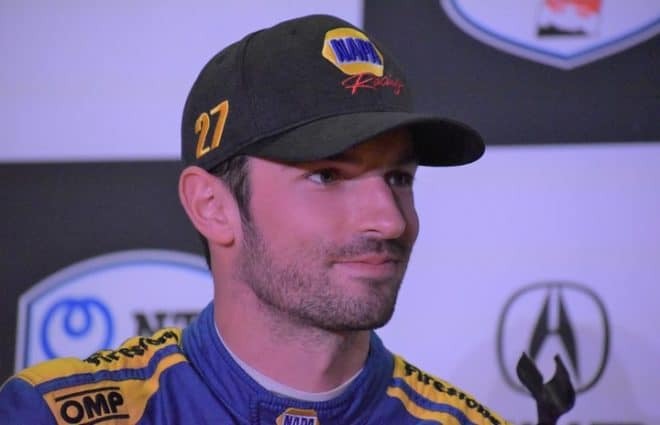 It seems more and more like the problems at Hendrick have absolutely nothing to do with their engines, but rather, something to do with the body or chassis. Martinsville, with aerodynamics not really playing a factor there, will be a good indicator as to if the problem at Hendrick has to do with handling. 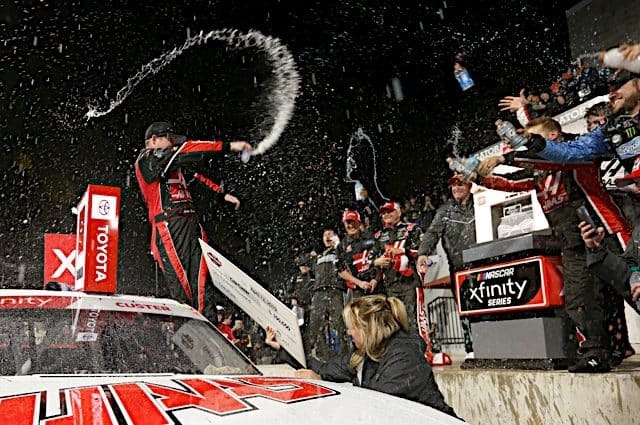 Is Martinsville just what the doctor ordered? It has not been a great start to the season for NASCAR. Ratings are slightly up, but there have been a multitude of competition problems, the biggest of which is the new rules package leading to worse racing by the week. But now, this weekend is just what the doctor ordered: Martinsville. The Martinsville Speedway is the oldest track in NASCAR, being the last original racetrack from the inaugural 1949 Cup season. Fun fact: Martinsville used to be a dirt track, and it was one of the worst on the schedule when it came to dirt just going everywhere. 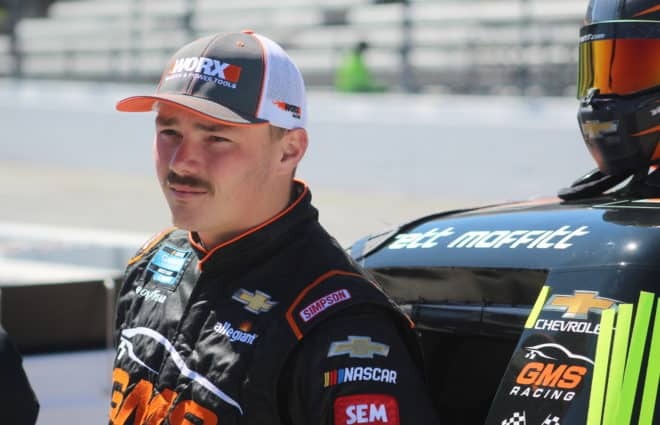 There’s a reason why that famous photo of Red Byron in Victory Lane following the first Martinsville race looks like he just got done working a double shift at a coal mine. Anyway, after being paved in 1955, the racing at Martinsville has largely been the same regardless of what year and what generation of car is being used. It’s the last reliable track on the schedule when it comes to guaranteeing an exciting race, where maybe even some fists are going to be thrown, and the last place where cars can really be torn to shreds but still able to compete for a win. Cup has an impressive amount of former Martinsville race winners, 10 in all, but one driver to watch this weekend will be one who isn’t, Martin Truex Jr. Truex has not won since July, but the closest he’s come since came in the fall race at Martinsville last year. The 2017 Cup champion was leading on the final lap before receiving a bump and run from Joey Logano, who won the race and eventually the championship. 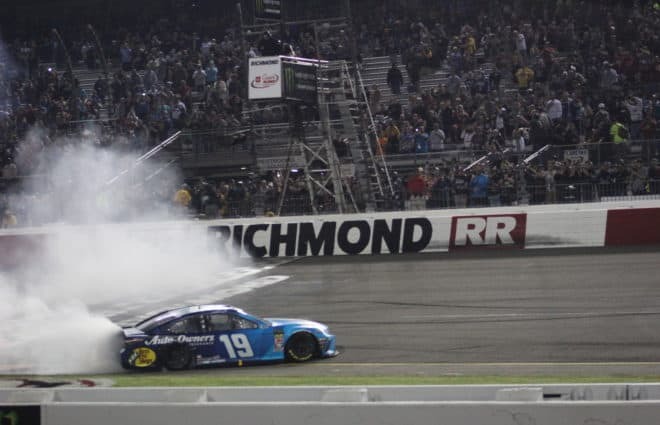 The way NASCAR is losing ratings, attendance and sponsors we may some day be back to fields of 12 to 18 cars including VW’s and MG’s just like when RP won 200.
i say it’s time to move on. enough already! Ricardo, The Modern Era of 1972 start is when Winston came on board as the title sponsor of the NASCAR Cup series, previously Grand National. It was at this time the schedule also shrunk to around 30 races or fewer for the season. It was also the beginning of the end to many of the short track races in the southeast even though most races were still south of the Ohio river and east of the Mississippi. Due to this change people began referencing the years since 1972 as the Modern Era of NASCAR similar to the AFL-NFL merger date in 1970 or so that was referenced in the article. Regardless, 200 wins at the top level of NASCAR trumps 200 wins at NASCAR’s top 3 levels combined. As far as number of races available to run, same thing holds true. Yes Petty ran in a lot of races but again they were sanctioned by NASCAR as top tier events versus BUSCH running 70+ races a year over the 3 series back in the mid 2000s through mid 20teens. Remember Kyle Busch also had the benefit and f the lucky dog where you’re given your lap back. Comparing stats of different eras is always complicated. So now the elephant in the room is how do we compare Championships? It’s quite obvious to me there are significant differences between the eras when Petty won his 7, vs when Earnhardt won his 7, vs how Jimmy won his 7. At least Petty and Earnhardt’s are somewhat similar in that the championships were won based on total point accumulations. Jimmy… well, he wouldn’t have 7 under that format would he? At least with race wins, one thing that’s stayed the same since the very beginning is that the first driver across the line after a set number of laps is still the winner. No drivers have ever been eliminated from being in contention to win the race because they were outside the top 10 (or 12, or 16) at any specific point during the race. Imagine if race stage 1 eliminated anyone outside the top 20 from being able to “advance” and claim the win in the race, then stage 2 eliminated anyone outside the top 10. NASCAR could end stage 1 and “reset” the laps completed to put all cars in positions 21-40 negative 1000 laps. Then after stage 2 those drivers between 11th-20th are all “reset” by negative 1000 laps. Positions 1-10 at the end of stage 2 are guaranteed no worse than a top 10. Everyone else is left to fight for 11th place – and a separate, much smaller trophy will be given to the highest finishing “eliminated” driver. Every driver who won a championship played the system to their advantage. Alan won his because he knew if he lead the most laps and finished second he would win even if Elliott won the (real) race.. Every year before the last event the leading driver knows that if he finishes above a certain position he would win. It’s the same in football. The team that scores the most points wins. Even in the present farce for the “championship” the drivers know that the best finish wins. He still doesn’t have to win the event but NA$CAR wouldn’t like it if he didn’t. Play the system. The same can be said about the individual races, some races were counted as championship points paying races back then but they aren’t today. For instance, on 5/21/61 there were two races run at Charlotte Motor Speedway, The World 600 Qualifier #1 and The World 600 Qualifier #2. Race #1 was won by Richard Petty and race #2 won by Joe Weatherly. Both races, even though they were qualifiers, were counted as race 20 and 21 of 52 races in 1961. So yes, the championship format has changed over the years but so have the races that counted toward said championship. That’s a fair point. I went back and did some research, and most of Petty’s titles were under a different points system than what was used when Earnhardt raced – it appears points back then were often based on how big the race was (judged either by purse money or race length), and some seasons had point multipliers based on different criteria (I didn’t take time to thoroughly understand them, but the system was definitely calculated differently). Try to explain away the 2007 championship Johnson won without the chase and the associated points reset. FYI: That whole R&D argument is a myth or, at the very least, greatly exaggerated. To think that a team, once qualified for the chase, will give up the chance to win more races the rest of the season in the name of R&D just doesn’t make sense.